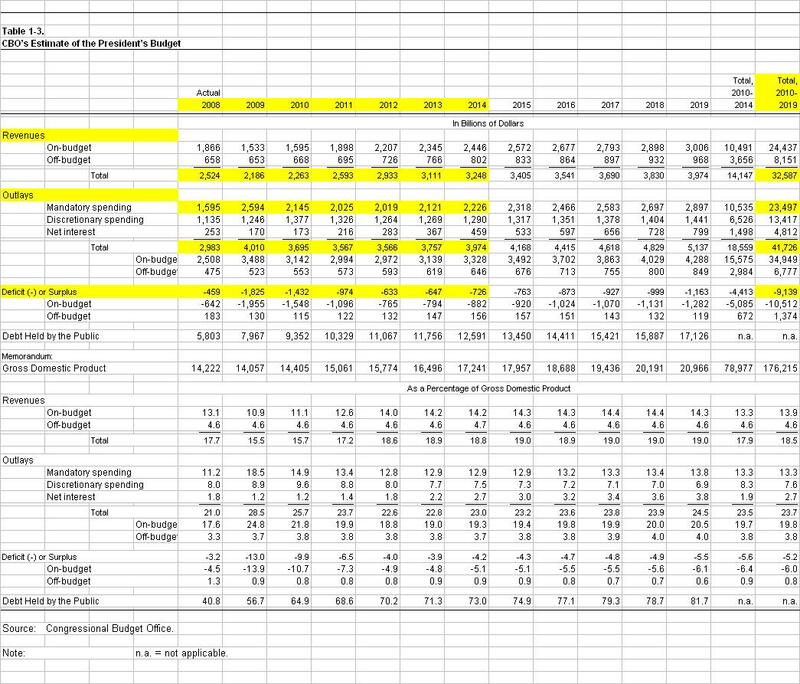 We begin with the Congressional Budget Office’s Estimate of the President’s Budget (above). Why wait until tomorrow? It’s on the CBO’s website at http://cbo.gov/? In FY 2009 and 2010 alone, entitlement spending is projected to exceed government revenue by some $290 billion. So the United States is facing a budget deficit, in just two years, before spending one dime on our defense, education, veterans pensions, and other vital programs. And this wasn’t supposed to happen for another 31 years? Is anyone still seriously considering dumping another $1 trillion dollars into this government-run ponzi scheme? Obama said he wanted an ‘honest debate’ on his health care proposal. Well, here’s the problem. We can’t afford to waste another dollar on some misguided government program, no matter how noble. Social Security is little more than a government-run Ponzi Scheme. Medicare is only 1/2 funded by premiums. Isn’t Medicare an example of government-run health care? Solutions abound, but what Obama is proposing isn’t one of them. I do beleive, no I know, they are all articulated in the mission statement of CESJ.org and the four pillars of the – Center for Economic and Social Justice. And much of what you have articulated yourself is supported by the Just Third Way Blog. Linked on cesj main page. Hmmm. Thanks nail. I will look over the just thrird way blog. Sounds like we have some ideals in common. By Dr. Norman G. Kurland -friends call him Norm. I would be happy to provide you with Norm's number.